Primarily sculptural, much of my work centers on the representation of iconic images and objects, appropriating specific attributes and translating them into new forms. Heavily influenced by the practical measures of the fine art world, these objects speak through the language of art handling and archival practices. 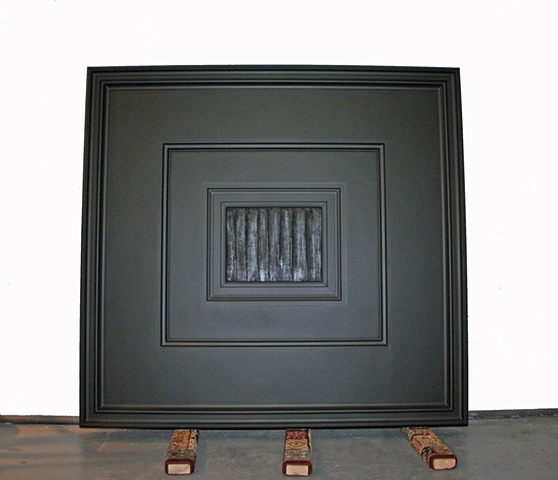 In one series of monochromatic sculptures, I work with the physical and conceptual structure of framing as both a means of recontextualizing an image and recreating it as a sculptural object. First incorporating found picture frames, then moving on to original constructions, the works employ the vocabulary of minimalism and historic monochrome painting to evoke the space and physical presence of art objects. In a more recent series, I use familiar formal elements from iconic, historical works of art—shapes and dimensions—to evoke their physical presence in a minimal, analogic way, in an interrogation of the collective memory obtained through their exhibition and reproduction. I overwhelmingly choose to work with non-conventional materials, utilizing objects found in hardware stores and lumber yards, in a gesture toward both my formative experiences in crating, framing, and art handling, and a means to focus on the literal “construction” of formal elements. Michael Hall currently works for Art Basel.